Hi folks, couple of things. Firstly a reminder that our residents winter get-together is this Sunday: From 6pm, 3rd floor roof terrace of Gaumont Tower. Click the thumbnail below to see the full size poster. Secondly, Maisie Collins has asked that I let you all know that she has changed the time and venue of her first meeting for anyone interested in her ‘Dalston Square Collective’ for freelancers and small business owners that reside on the Square. New details are on Maisie’s forum post HERE. Lastly, did we all receive the Holy Trinity Primary School flyer below (click on the thumbnail for the full size image), which I found in my mailbox earlier in the week? I intend to attend the meeting on Monday and will report back with my findings. A forum thread has also been started about this planned development HERE. Have a good weekend all! Firstly, the minutes from the last general meeting of the DSRA are available for download (.pdf file) in the DSRA specific section over at the forum HERE. If that link does not work for you, please read this forum post HERE, and all should become clear. These minutes are available to all residents (renters and owners alike) of Dalston Square: But only residents of Dalston Square. If anyone has any problems getting the minutes, please feel free to contact me (via the general chat section of the forum is best). Secondly, hands up if you know Maisie Collins. Keep them up if you knew Maisie started the Residents Association single-handed? Well done if you still have your hand up. 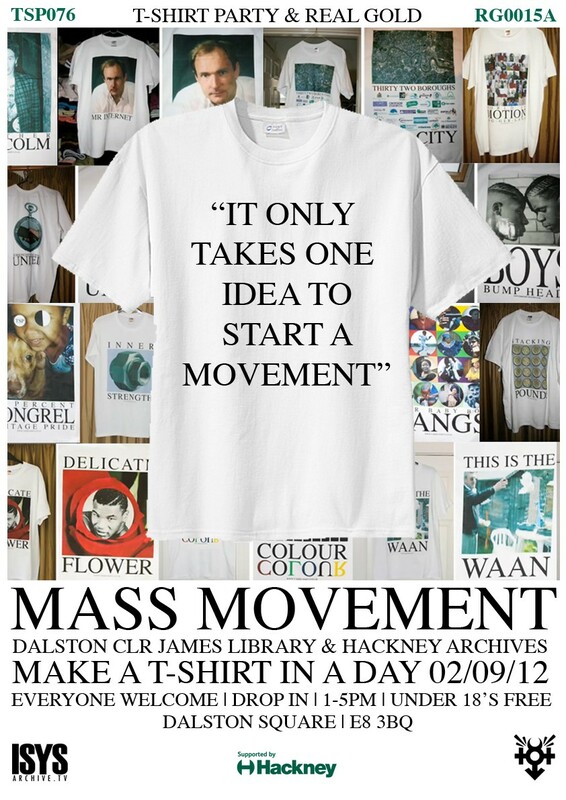 Maisie had now decided it is time for her newest project: The Dalston Square Collective. Do you work freelance? Perhaps run your own small business? From home on the Square? If you answered yes to any of those options you must read Maisie’s post at the forum (worth a read if you didn’t answer yes – you never know): HERE. More soon! Enjoy your weekend. Hello everyone. Bit of a long one today, but please do read through as there is definitely something here for everyone. The main thing will be an update in the shape of a newsletter to keep you all informed of what has been happening in a slew of recent meetings. But first a couple of other notices. First up, another public event has been organised by Hackney Council for this coming weekend (Saturday 27th October) here in the Square. Running from midday until 4.00pm, to celebrate the opening of the new Young Hackney Centre on Forest Road/Beechwood Road, there will be free, yes FREE, bungee trampoline! Trained instructors will be there to ensure complete safety and no booking is required: First come, first served. For full details visit the council’s dedicated Dalston Square website HERE. The other quick mention I wanted to make is regarding the new permit system for the underground parking here on the Square. As you will all be aware (thanks to Consort posting out to every residence) the new system is now up and running. If you have a vehicle parked in the underground parking but do not have a permit to display in your vehicle’s windscreen, get one asap from the concierge guys or you will very soon find you have received a parking ticket (if you didn’t get one already). Okey dokey, newsletter time (courtesy of DSRA Chairperson Ben Collins, thanks Ben). The glass canopy (between Gaumont and Collins Towers) was vandalized by persons unknown throwing stones from one of the nearby building roof-tops. It seems that an intruder entered through a poorly working security door in either Collins or Gaumont Tower on both Friday 29th and Saturday 30th of September. The damage and repair costs are estimated at around £25,000.00. It is not yet clear who will pay for this. The residents association will argue that the damage was caused by care-taking negligence, resulting in a lapse in building security. There is also a case of inappropriate design and use of materials, on behalf of Barratt Architects. The DSRA will campaign to ensure any costs are not met retrospectively by an increase in our service charges for 2013-2014. We need your support for that so please come along to our next meeting. The residents association have long been concerned that Consort site staff have not been delivering value for money for the high service charges we all pay to keep the building in a good state of cleanliness and repair. The smashed canopy was in part a result of site management negligence. There have been ongoing small issues which we feel have not been properly addressed. Amongst these have been keeping all entrance doors in good working order, keeping paintwork in corridors clean, ensuring rubbish containers are accessible, and keeping entrance thresholds and lobbies clean and litter free. Consort management are aware of our concerns regarding these matters, as well as a number of others. We will continue to monitor progress on these items under any future site team, to ensure we get value for money. Work is now under way on the new Co-op which will soon be opening in the North West corner of the Square beneath Ocean House (next to Dalston Junction overground station). We do not have a date for that opening but assume it will be soon. Also, a new café by the name of Café Square is to open in the commercial unit beneath Gaumont Tower, facing Collins Tower. While this is clearly a welcome development, residents are concerned about proposals for a vent grille at ground level, which could well see kitchen odours travelling up to resident’s balconies and windows above. If you want to respond to this plan, you may do so by visiting the Hackney Council website HERE. Simply enter the application number 2012/2818 (all comments must be in by October 31st). There is also some concern regarding the café’s licencing request to the council: The application request seems more suited to a bar than a café. More details available at our discussions forum in this thread HERE. The issue of noisy parties into the early hours continues to cause many residents stress on week-end nights. The resident association appeals for respectful consideration of the right of others to a quiet night’s sleep. Those who are subjected to unreasonable noise by unreasonable neighbours at night should not hesitate to contact the concierge service who will keep names private but will intervene on your behalf. You can pop down to speak to the concierge or call them on 0751 630 2926. It is also advisable, should there be a repeat, or a noisy late night event outside the building, to contact the Hackney Council Noise Pollution Team on 0208 356 4455 (alternatively you can contact them through there website, a link to which is in the link list on the homepage of our website). Following repeated complaints by several neighbours about noisy parties at one particular residence on the Square, the resident association has been informed that the tenants responsible were evicted earlier this month. They were in breach of the terms of both lease and tenancy agreements, which stipulated that noise should not be audible in neighbouring flats after 11.00pm or before 8am. So if you suffer because of thoughtless neighbours, you can do something about it. The residents association is campaigning for an improvement in the bike storage and security in the Square, both inside and outside the buildings. It seems that while good space was made for cars, the provision for bikes was an afterthought. Secure bike stores are either not secure or often not easily accessible to the user. Both these defects mean that many, if not most, are obliged to take bikes up in the lifts causing a number of problems. We are meeting with Barratt to push for some changes in location and design to see if matters can be improved. We need the backing of cyclists on this! Let us know your views via our discussion forum HERE. 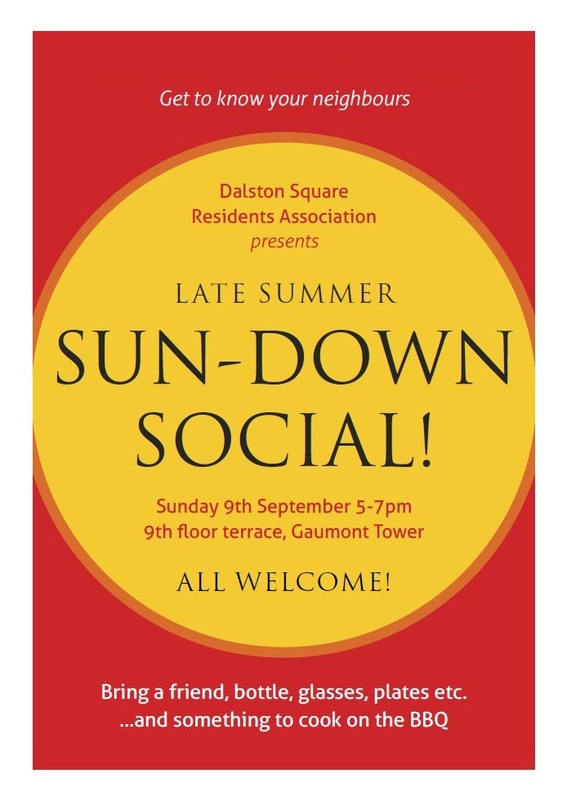 The Dalston Square Residents’ Association is keen to ensure all resident’s voices are heard. We invite all residents, owners and renters alike, to our open, 6 weekly, committee meetings. The next open committee meeting is on Tuesday Nov 20th. More details nearer the time on our website. We also encourage everybody to make use of our discussions forum. Anyone can read the posts on the forum but to reply to someone’s post or start a conversation yourself you will need to register (a quick and simple 2 minute process). If you have any opinions regarding anything mentioned here, or anything else come to that, don’t keep them to yourself, share them. Hi everyone. Bet you have never seen the words ‘Minutes’ and ‘Cricket’ together before: Cricket is normally accompanied by the words ‘Hours’ or ‘Days’. In this instance though ‘Minutes’ refers to the minutes of last week’s DSRA meeting which are now available for download from the forum HERE (if that link does not work for you, read the last paragraph, starting with PLEASE NOTE, of THIS). 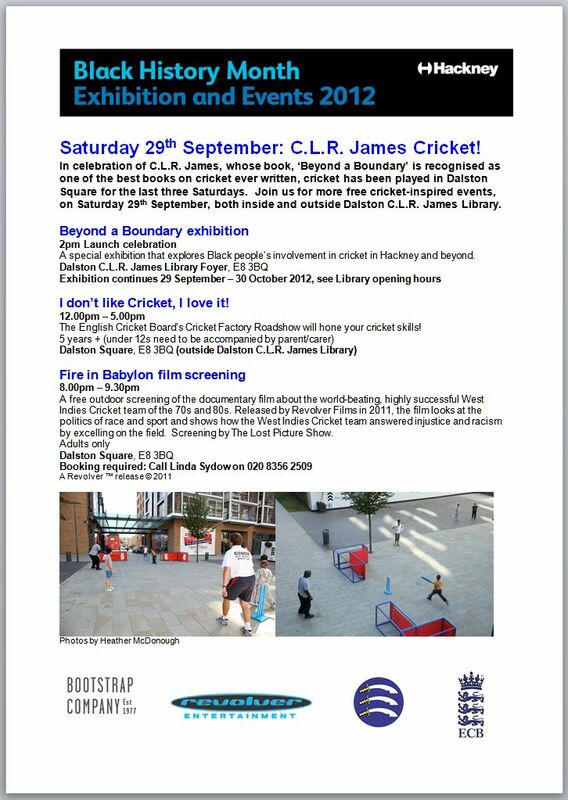 I am very pleased to invite you to a special day of cricket-inspired events both inside and outside Dalston CLR James Library, this Saturday (29th Sept), as part of Hackney’s Black History Month 2012. For CLR James, whom Dalston’s new library is named after, cricket was not just an entertainment and relic of empire, but also a means of struggle for independence and national pride for the West Indies. His book ‘Beyond a Boundary’ is recognised as one of the best books ever written on cricket. As a celebration of CLR James’ legacy, Dalston Square is temporarily being transformed into a cricket haven by day – with trained coaches from the English Cricket Board’s Cricket Factory Roadshow – and a cinema by night – with a free screening of Fire in Babylon (2011, Revolver Films). Please see the attached flier for more details. Also this Saturday, the library will host the launch of a special exhibition about the involvement of black people in cricket in Hackney and beyond. The exhibition focuses on the experiences of nine local cricketers and presents their reflections upon the game both in Hackney and in the West Indies. You are invited to the opening of this exhibition at 2pm on Saturday, 29th Sept, in the foyer of Dalston CLR James Library, Dalston Square, E8 3BQ. I do hope that you will be able to join us. Also in Dalston this Saturday, Gillett Square will be hosting ’20 Drum Sets: 20 Drummers’, as part of UPLOAD, a multi-platform festival festuring a stunningly diverse programme of new projects from the Loop Collective. In the early afternoon, 20 drummers (and drum kits!) will convene on Gillett Square and perform a one-off piece of music, featuring some of the finest drummers/percussionists in the UK and surely one of London’s musical highlights of 2012. Throughout the afternoon, the festival will feature a number of surprise pop-up acts and intimate performances around the square.See www.gillettsquare.org.uk for further details. So there you have it. And click the thumbnail image below to see the full-size image of the flyer that Lucy spoke off. Have a good weekend everyone. Hello all, I have some news and updates to share and will try not to ramble too much. Firstly, some good news for those of you still using E.On as your electricity supplier (not to be confused with E.On heat supply). It has been pointed out that most energy suppliers now offer discounts to customers who use a single supplier for both their electricity and gas supply, and how unfair it is that although we have no gas we are tied to E.on for our heat, but still we do not qualify for some kind of discount also. Well, thanks to some great detective work from Andy T. (resident of Labyrinth Tower), it seems we are eligible for a discount after all. There is, however, a problem in that although E.On have agreed to give us the discount, it is not yet set up in their billing software: I have spent over an hour in total, in four phone calls, over 3 days trying to get it arranged for myself. So, I have an arrangement with a supervisor at E.On whereby as soon as things are set within their systems, I will be advised that they are ready to receive calls from all residents for whom this will apply, and of course I will then let you all know exactly how to claim this discount for yourselves. And do not worry that you are missing out whilst being delayed: E.On are back-dating the discount to the beginning of your account with them! Pretty cool I think you will agree. It could be 4-6 weeks I am told but will get back to you all as soon as I hear from E.On. Next up, another find from Andy T. (he has been a busy boy) that will be useful for anyone struggling with anti-social neighbours and loud parties. As well as being able to phone the Hackney Council noise pollution team to make formal complaints (020 8356 4455), they also have a website for the same purpose: Click HERE to go straight to it. Just one request though: If you do contact the council directly regarding a party or generally noisy neighbours, please be sure to report it to the concierge as well so it gets logged in Consort’s log-book. Thanks. On a more positive note, Hackney council now have a webpage dedicated to Dalston Square and the activities organised by their Culture & Community Engagement Forum. You can find it HERE. As you will see, there is already quite a lot of events on the cards, with plenty more to come I believe. Check it out to see the details of this coming Sunday’s (tomorrow’s) t-shirt design & printing event that is completely free for under 18s: Very cool. Do please note that under 12s must be accompanied by an adult. The event will take place in the library, spilling out into the Square if weather permits. Click the thumbnail image at the bottom of this post to see their advertising poster. Lastly, a word regarding posting comments to these blog posts. Please do not use fake names and spurious email addresses, and please keep the comment relevant to the post you are commenting against. All other comments or questions should be posted to the discussions forum. Many thanks.